Today we make the acquaintance of a gentleman of letters, who amassed a collection of books and manuscripts that went on to reside in the Bodleian Library. 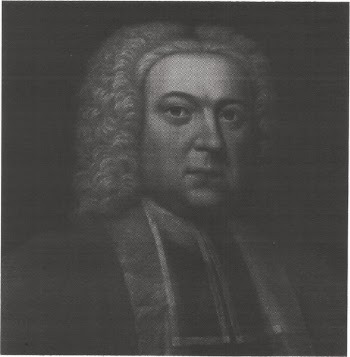 Richard Rawlinson was both the son Sir Thomas Rawlinson, Lord Mayor of the City of London, and enjoyed a fine education first at Eton and then at Oxford. An outstanding student, Rawlinson was elected a Fellow of the Royal Society in his early twenties and in 1716 was ordained. Almost immediately following his ordination, Rawlinson took a leave of absence from his duties in England to travel Europe. Here he immersed himself in continental culture and literature, amassing a vast collection of antiquities and an enormous library of books. He returned to England at the age of 38 to take the office of Bishop and fully intended to bequeath his collection to the Society of Antiquaries. However, as they years drew on Rawlinson found himself in disagreement with the Society over the direction it was taking and amended his will to reflect his dissatisfaction. He moved his collection to the Bodleian Library and on his death, bequeathed over 5000 manuscripts to the Library. In addition, he left in place funding for a professorship of Anglo-Saxon at Oxford University that continues to this day. I've spent many a happy hour with the Rawlinson MSS - a fantastically diverse collection.